Freestanding awards look great on mantels, display shelves and more. The top star promotional award highlights any logo. 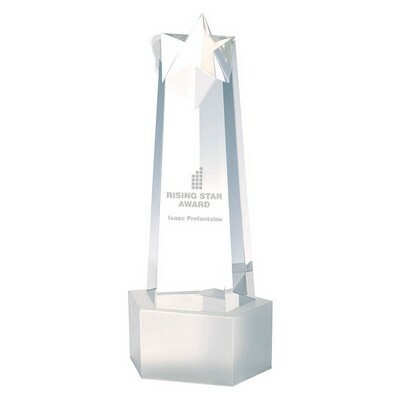 This Rising Star Tower Awards are made from optical crystal, and feature a prismatic tower for an eye-catching display. Standing at tall and deep etched, this custom crystal award is made to impress. Bevelled edges and a broad imprinting face are sure to catch their eye. You can easily insert your brand details to create customized giveaways for promotional events. Click on the location(s) where you want your etched logo to appear.